I'll never forget my first marketing class at business school. Our professor peered at us with an intense glare as he pushed back on our standard, "chip shot" comments. At one point in the class he asked the guy next to me to opine on the case we were discussing, which involved launching a new consumer product. "Well," my neighbor answered confidently, "I think it will be a hit because I can see my mother-in-law buying it." "I see," replied my professor dryly and then turned to the class with a withering look on his face, "Steve appears to have fallen into that fatal trap of 'Mother In Law Market Research' – believing this new product will be a hit just because his mother-in-law likes it. Instead, let's look at the data, shall we?" This put down to allowing personal experience influence your assessment of new products and services came back to me this week while at my board meeting for our mobile video portfolio company, Transpera. As we discussed poor video delivery quality and AT&T's clogged network, eveyone started devolving into their own anecdote of "what happened when I tried to watch a recent video on my iPhone". Yet, although I know it frustrates entrepreneurs, I confess to being sympathetic to investors who use their own experience as a guide to their investment activities. Frankly, I think it is a critical part of my job as an investor to try out new products and services and those experiences certainly do inform my investment judgment. Many VCs I talk to feel the same way. Brad Feld wrote a great article in this month's Entrepreneur Magazine urging entrepreneurs to let him play with their products rather than present them to him. Jack Dorsey, the founder of Twitter, recently told me that the reason he chose to work with Fred Wilson, rather than a host of interested Silicon Valley VCs, is that Fred was a Twitter power user from the beginning. When Fred first met the Twitter team, Jack said he was full of new ideas of where to take the product and the power of the model. The desire to experience new products and services and technologies is why I own a Blackberry, an iPhone, a Kindle, a Sonos, a Roku, and subscribe to a ridiculous number of online services, blogs and feeds. I also study how my pre-teen and teenage kids interact with games, devices, IM, Gmail, Google Buzz, to get insights into how younger users will experience the emerging connected world. I even throw things at my wife that are targeted at her demographic to get her outside perspective on them. Anyway, here's my simple advice to entrepreneurs: tell a story. As John Quincy Adams says in the movie The Amistad: "Whoever tells the best story wins." Make it real for the prospective investors. If they're not the target market, bring that target market user's pain and pressing need for your new whizbang product or service to life. And don't be afraid to ask your mother-in-law for advice. In his storied baseball career, Curt Schilling has rarely found himself at a loss for words. So it was great fun to watch him sit speechless for an hour as Harvard Business School students dissected his entrepreneurial venture and some of the choices he was making as a manager, leader and strategist. The setting was akin to sitting around the living room analyzing last night's World Series pitching performance. Judging from the rigor of their analysis, the students would have put a bevy of ESPN and newspaper sportscasters to shame. 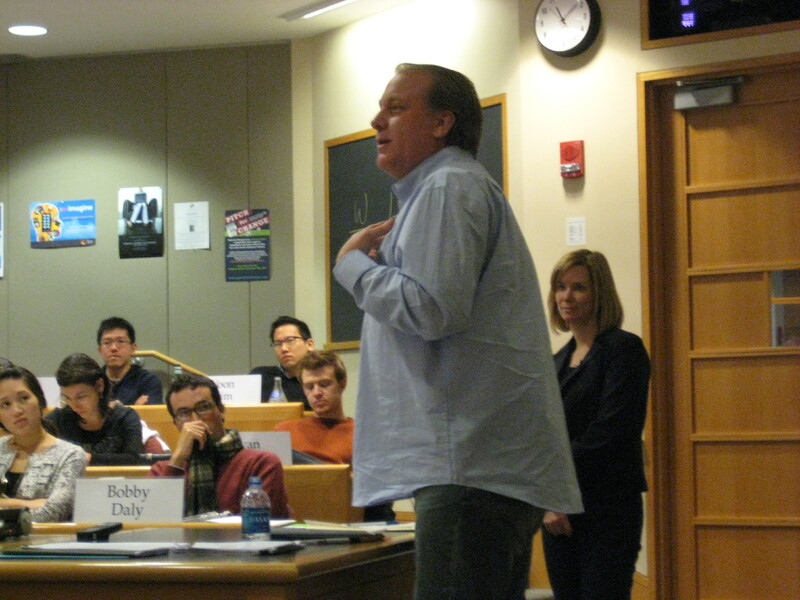 The two classes I taught this week at HBS, based on a case that I co-authored with Professor Noam Wasserman called "Curt Schilling's Next Pitch" (which you can order here from HBS Press), were energized to have Schilling in the classroom alongside his CEO Jen Maclean. Although none of the students can relate to his triumphs and tribulations as a professional athlete (save one student who was a professional soccer player before turning to a business career! ), they could all relate to his struggles to launch his gaming start-up, 38 Studios, and his efforts to chart a course for success for the growing company, which now has over 130 employees. My favorite line for the day was when, during the Q&A session at the end, Schilling started off by confessing, "After one year at a junior college and a 23 year career in professional baseball, it cost me nearly $30 million to get to Harvard." The comment was in reference to the fact that Schilling has been funding 38 Studios almost entirely out of his own pocket. Many VCs turned him down when he first launched the company in 2006 and 2007 (including me, which is the subject of a funny story, where a VC buddy of mine and I ended up having dinner with Schilling alongside our then 7 year old sons in Fort Meyers, FL in 2007 while he was in the midst of Spring Training, but that's another story for another day). Entrepreneurs who have been successful in one field and have developed a "blueprint" for what it takes to be successful, can sometimes struggle to translate that blueprint into a new field. Therefore, they should be thoughtful about what skills and habits they should adapt to develop a new blueprint that suits the new field. I have been through this myself personally when, after being an enterprise software entrepreneur at early e-commerce leader Open Market in the 1990s, I embarked on becoming a consumer Internet entrepreneur at Upromise and had to learn a whole new blueprint (never mind learn the VC blueprint I find myself still adapting to since I made that conversion seven years ago!). Harnessing and containing strong, visionary founders is a tricky endeavor, but there are some useful techniques that can be applied to improve the chances of success. Some of the students had worked with Jeff Bezos, Michael Dell, and other larger-than-life founders, and shared their related challenges and lessons learned in those environments. In many situations, the founder is a creative force of nature rather than an experienced operating manager, and skillfully managing the tension between those two essential ingredients can make or break a start-up. Schilling was a great sport and everyone had good fun. As he observed when we first sat down to interview him for the case, "Jeff, I don't mind being put in the lion's den. They can't be any worse than the Boston sports media." All joking aside, the 140 HBS students ended the class with tremendous respect for his entrepreneurial skills. In a poll taken after reading the case, approximately two thirds of them thought he had what it takes to become an All Star entrepreneur. One third was more skeptical. Stay tuned. 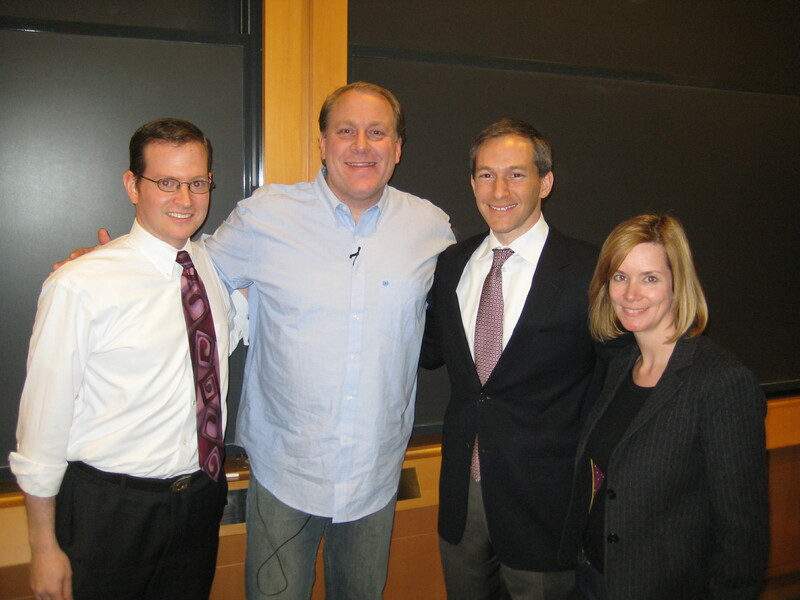 pictured (L to R): Professor Noam Wasserman, Curt Schilling, me, 38 Studios CEO Jen Maclean.